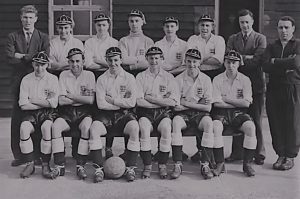 Over the years several players from Bere Regis Football Club have gone on to play at a higher level, but none more so than Cyril Hewitt who signed professional forms for Portsmouth FC in the early 1950’s, having previously been capped five times as an England Under 18 International. After his death in 2016, the following obituary appeared in the match day programme for Dorchester Town on 6th August 2016. “Cyril was born at Bere Regis in 1933 and began playing football at an early age, and played for his school eleven. It was quickly apparent that Cyril was a talented goalkeeper and was soon selected to play for Dorset. 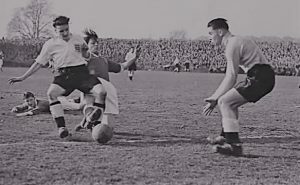 Immediately on leaving school Cyril signed for Poole Town and was subsequently selected for the English Youth trials, and was then chosen to play for the England Youth team, gaining five international caps after playing against Wales and Scotland, and then on a tour of Spain he also played against Switzerland, Austria and Spain. In 1951 Cyril signed professional forms for Portsmouth, but was then called up for National Service, where he served with the 6th C.I.C at Blandford and was a regular member of his Unit team. On demobilisation he returned to Portsmouth, who had retained him, and stayed with them for two years. In 1955 he signed for Yeovil Town, where he stayed for one season, and in 1956 he was signed for Dorchester Town by the Players Manager Ken Bird, and became a firm favourite. Cyril then went on to play for The Magpies from 1956 until 1961, subsequently under the management of Arthur Proudler and Marcel Galliard, making a total of 34 league appearances, although as with Neville, he would almost certainly have made additional cup appearances. Cyril passed away peacefully at home in Bere Regis on the 2nd April 2016, aged 82, after which his sons, Gary and Kevin, decided to donate one of Cyril’s England caps to Dorchester Town and another to Poole Town, a gesture that was reported in the Dorset Echo. That report notes that Cyril once turned down the famous Bill Shankley, who tried to sign him for Liverpool. Click here to see that Dorset Echo Report. 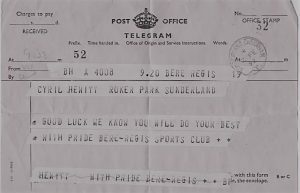 A telegram from Bere Regis Sports Club, sent to wish Cyril good luck in a game against Scotland at Roker Park, Sunderland on 2nd February 1952. The game was cancelled!